CITIZENS BREWING WITH CIVIC ENGAGEMENT. Phil Johnson of Ayres Associates discussed preliminary plans for the Cannery Redevelopment District in front of a standing-room-only audience during a community vision session January 21 at Lazy Monk Brewing. From an indoor public market to mixed-income housing to riverside trails, there is no shortage of ideas for the future of the Cannery District, a 30-acre neighborhood on the west bank of the Chippewa River. The district, formerly the site of canneries and other industrial facilities roughly across the river from downtown Eau Claire, is now largely vacant and has been eyed by the city for redevelopment for several years. 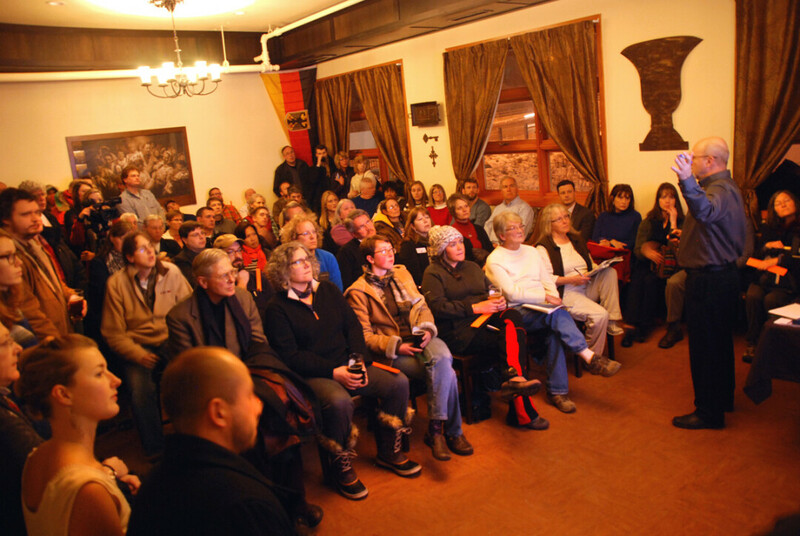 This pending rebirth was the subject of a standing-room-only community visioning session Jan. 21 at Lazy Monk Brewing, 97 W. Madison St. More than 80 community members packed a conference room to hear a presentation about tentative plans for the district and to voice their opinions about what should be there. “We’ve been slowly buying up properties on the riverside,” explained Mike Schatz, the city’s economic development director. Currently, the city’s Redevelopment Authority is working with Family Video to acquire land along the riverfront, allowing the creation of a public trail that would run from the recently opened High Bridge at the north end of the district to Madison Street in the south. The trail would then go under the Madison Street bridge and continue along the river behind the new Lazy Monk site, formerly Charleson’s Interior Design. The RDA has also bought numerous other properties with the hope of turning them into new public spaces, such as parks, as well as selling them to private developers for new uses. Schatz said the RDA is a year or two from buying all the properties it is interested in. After that, feedback gathered from the public will begin to shape details of the city’s plans. “We have found that redevelopment is a marathon rather than a sprint,” Schatz told the audience. He explained that Eau Claire-based architectural and engineering firm Ayres Associates was hired to work on two phases of the project: designing the public spaces for the district as well as creating plans for overall redevelopment, whether it’s for residential, commercial, or retail use. Phil Johnson, a landscape architect with Ayres Associates, explained that a draft plan prepared last year recommended creating three public areas in the district. At the north end would be the 4.2-acre Highbridge Neighborhood Park, which would include two river overlooks, a skateboard plaza, a “flex field” that could be used for youth soccer, and a paved court that could be used for basketball and pickleball. Just to the south would be the 8.8-acre Cannery Park, which could include a performance area with hillside seating, a sledding run, a winter “chill zone” with fire pits, family pavilions, a “fitness garden,” and space for disc golf. Finally, the Cannery Trail Corridor would run along the rest of the river, providing upper and lower trails for walkers and bikers as well as space for disc golf and a kayak/tube launch. These facilities would help replace a current park, Kessler Field, which is slated to be redevelopment. This image from a preliminary public space plan for the Cannery Redevelopment District shows a cross-section of how the property could look, including new development and two riverside trail corridors. Click for a closer look! Schatz explained that the park ideas are just that – ideas – and haven’t been approved by the Redevelopment Authority or the City Council. If and when plans are OK’d, the city would have to determine how to pay for the new public amenities. Audience members were asked numerous questions about potential uses for the Cannery District, voting with the help of color-coded paddles. The straw poll indicated that both neighborhood residents and other community members in attendance broadly supported the construction of multiple kinds of residences in the district, including market-rate, senior citizen, and low-income housing. There was also strong support for making the neighborhood more pedestrian-friendly as well as making it the site of food-related businesses such as restaurants and a grocery store – something that is lacking in that part of town. During a freewheeling comment period, residents piped in about what they saw as the positive potential for the district. Many stressed the natural beauty of the riverfront and the potential for environmentally friendly components such as rain gardens, “green” street lighting, and plants that would attract pollinators such as bees. Others emphasized the potential creation of a “food hub” in the neighborhood that could connect people of diverse backgrounds around the basic human need of eating. The latter idea is the subject of a separate city-led effort. With the help of $100,000 in grant funding and donations, the city plans to hire a consultant to explore the idea of creating a year-round public indoor market, said Ned Noel, associated city planner. Such a market – which could be a nonprofit entity, a private business, or some combination of the two – could be built in the Cannery District or elsewhere, Noel said. Following the meeting, Schatz said the feedback would be discussed by the Redevelopment Authority in the near future. After that, conceptual plans for the Cannery District will begin to take shape. To learn more about the city of Eau Claire’s redevelopment efforts in the Cannery District and elsewhere, visit eauclairedevelopment.com.